Lawyers representing Ontario nursing home patients are demanding police hand over everything they know about two more crimes serial killer Elizabeth Wettlaufer is alleged to have committed. The 51-year-old former nurse provided information about the crimes last year, while serving a life sentence for murdering eight patients in her care, and trying to harm, or kill six others. CBC News has obtained court documents showing the Ontario Association of Residents’ Councils (OARC), an advocacy group for people in long term care homes, has now filed a legal application aimed at forcing the Ontario Provincial Police and Woodstock and London police to hand over all the evidence gathered during their investigations into the two additional alleged crimes. All three agencies were involved in the probes. OARC is asking Commissioner Eileen Gillese to make the order. 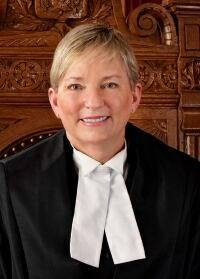 She’s been presiding over the public inquiry tasked with looking into Wettlaufer’s crimes and why they went undetected for years. The OARC argues the additional confessions should never have been withheld from various stakeholders participating in the Inquiry. “The participants have been operating on the mistaken belief that we had access to all of the relevant information,” said documents filed by OARC lawyers Suzan Fraser and Jane Meadus. “There appears to be more to the story: more related to other victims, more related to the circumstances leading to and surrounding the offences, and more that could have the potential to lead to meaningful findings and recommendations,” they added. Police determined Wettlaufer injected a 77-year-old woman with insulin in August 2014 at the Meadow Park care facility in London, Ont. The woman, Florence Beedall, was not diabetic. She died hours later from unrelated causes. Wettlaufer also allegedly tried to smother a patient at the Caressant Care facility in nearby Woodstock. The identity and age of that victim is not publicly known. The police investigations determined Wettlaufer could be charged with additional counts of assault with a weapon and assault causing bodily harm. However, the charges were never laid. The additional alleged crimes were never revealed to the public until CBC News uncovered details about them, earlier this year. The public inquiry told CBC News earlier this year that it knew about the two additional alleged attacks as far back as January 2018 — months before the Inquiry began. But the information was never disclosed, despite months of evidence and testimony during the multi-million-dollar proceedings. The Wettlaufer inquiry said in a statement to CBC News at the time it was powerless to act on what it knew. “While the further police investigations were underway, the commission took no steps because anything that might have been done could have interfered with those police investigations,” said an unsigned email sent to CBC News from inquiry officials. “The commission was not told by the Crown of the outcome of the further police investigations until December 2018,” according to the statement. But a copy of a London police report regarding the Meadow Park attack reveals police had already concluded their investigation six months earlier, in June 2018. The care homes where the additional alleged attacks took place don’t appear to want information about the additional crimes released, according to the court application CBC News has obtained. In fact they seemed to suggest additional crimes did not exist, despite what police determined. They are “essentially unproven allegations of additional new crimes,” wrote Lisa Corrente and David Golden, lawyers representing Caressant Care, Meadow Park and its parent company Jarlette Health Services in its legal response to OARC’s application. “It would be entirely prejudicial to disclose fresh unproven allegations – they offer little, if anything, of value on the systemic issues” at the care homes, according to the lawyers. They also argue the new information could delay the inquiry and prove emotionally difficult for the families of Wettlaufer’s 14 other victims. As it stands, the inquiry is in its final stage — drafting recommendations on how to prevent similar crimes in the future. OARC maintains the additional alleged crimes cannot be ignored. “Failure to deal with them has the potential to undermine public confidence in the inquiry process either by giving the appearance that these are lives that the commission is not interested in or that the report is more important than the social functions,” wrote Frazer and Meadus in their filing. Wettlaufer told police she felt a “red surge” of anger before attacking the previously identified victims. The former nurse admitted to lethally injecting insulin into seven residents at Caressant Care: James Silcox, 84, Maurice (Moe) Granat, 84, Gladys Millard, 87, Helen Matheson, 95, Mary Zurawinski, 96, Helen Young, 90, and Maureen Pickering, 79. She admitted to fatally injecting 75-year-old Arpad Horvath at Meadow Park.